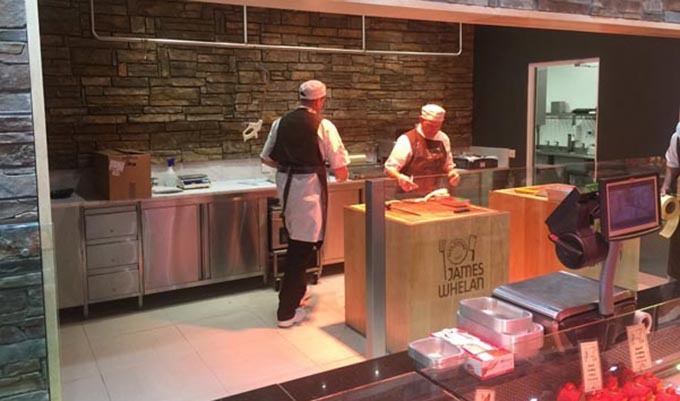 Kavanagh Engineering has just completed another prestigious shop fit-out contract, this time for the Whelan’s Butchers shop at the Dunnes Stores Oakville Shopping Centre in Clonmel. Whelan’s Butchers is itself originally a Clonmel business. It has become closely aligned with Dunnes Stores in recent years, and our work was part of the furtherance of those links. This project entailed extending the Whelan’s Butchers into a Show Prep room which was at the back of the counter. This new space gives the butchers more room to work, and affords customers a nicer view. Kavanagh Engineering had responsibility for the complete project, from knocking walls at the beginning to fitting stone to walls and laying floor tiles. We also altered existing stainless steel units (which were taken from a job in Dublin) to fit along the back wall, and installed a new Minerva worktop with a hand wash sink cut into it. Work was carefully planned to bring minimum disruption to the store, and was carried out by expert operatives at all times. The reaction to the finished new butcher space has been wholly positive. It is Dunnes’ intention to introduce a Whelan’s Butchers to all their more upmarket stores around Ireland. There is already a Whelan Butcher’s shop in each of the prestigious Avoca Stores in the country. At Kavanagh Engineering, we’re proud of the work we did for Dunnes Stores and Whelan’s Butchers in Clonmel. We look forward to doing more high-quality shop fit-outs in the future. Contact us if you would like to talk to us about your own retail space, and how to make the most of it.